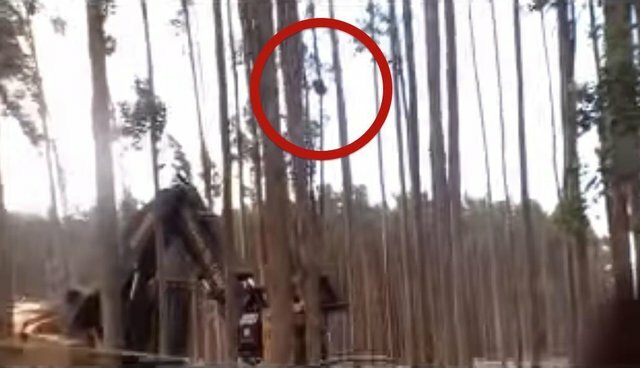 A distressing new video shows a gum tree being felled by loggers while a koala and her baby are still clinging to it. The incident took place in late January in a logging area in Bessiebelle, Australia. The area is operated by the nation's largest woodchip exporter, Australian Bluegum Plantations (ABP), whose work there has been halted as a result. A representative from ABP told The Standard that the company employs koala spotters to make sure that trees are uninhabited before they are chopped down, and said that these particular animals were overlooked as a result of "human error." Fortunately, the koalas are believed to have survived the fall, but that has done little to quell anger over what some are calling "blatant disregard" for the animals' welfare. This isn't the first time the company has come under scrutiny for its treatment of the furry marsupials. In 2013, ABP lost its environmental credentials after it failed to follow safety guidelines, which resulted in koala injuries and deaths. "Koalas have been forced over-time to reside in bluegum plantations through loss of their natural habitat," writes the group Wildlife Victoria on Facebook. "There have been a series of meetings held over the last two years involving all relevant stakeholders where we have been told that these barbaric practices have ceased and new safe protocols have been put in place. Sadly, these are just words and clearly on the ground operations have not changed."